CAPE CANAVERAL, Fla — SpaceX is working toward returning the aerospace firm’s Falcon 9 launch vehicle to service within the next few weeks. SpaceX announced on Oct. 16 that it would return the Falcon 9 to service on an upcoming flight of 11 Orbcomm satellites. If successful, it will mark a rapid turnaround from a recent setback that the company encountered. The launch of the Orbcomm satellites will be the first mission undertaken by the F9 booster since the June 28, 2015, CRS-7 mission – which resulted in the complete loss of another Falcon 9 rocket, its payload of a Dragon spacecraft, and the 4,000 lbs (1,800 kg) it carried. According to a report appearing on SpaceFlight Now, the announcement of the Orbcomm mission as the payload that will consist of the Falcon 9’s next flight represents a change of plans. Initial reviews of SpaceX’s revised launch manifest had it that the next launch would be the SES-9 communications satellite. However, according to the NewSpace firm, the decision to make the change was agreed upon by all of those involved and the change was made. “As we prepare for return to flight, SpaceX together with its customers SES and Orbcomm have evaluated opportunities to optimize the readiness of the upcoming Falcon 9 return-to-flight mission. All parties have mutually agreed that SpaceX will now fly the Orbcomm-2 mission on the return-to-flight Falcon 9 vehicle,” SpaceX noted via a statement issued. SpaceX’s annual launch manifests have been viewed by many within the industry as being overly-ambitious with as many as 14 or more missions being listed on initial launch manifests issued by the company. Since June of 2010, SpaceX has launched a total of 19 times – or roughly 4 (3.8) flights per year. At the time of the CRS-7 mission, however, it appeared SpaceX was on track to shatter records with six flights carried out. The events that transpired roughly two minutes and 19 seconds into the flight had significantly altered the pace the company had been setting. At present, SpaceX is hoping to carry out at least two more missions before the close of the year – bringing the total to eight launch attempts for 2015. While the June 28 accident might have placed the firm in somewhat troubling waters, overall the company has exceeded expectations. On average, about 75 percent of all new launch vehicles encounter a catastrophic failure within the first three flights. SpaceX did not encounter an issue until the 19th time the Hawthorne, California-based aerospace firm launched one of its Falcon 9 rockets. Unlike the complex CRS-7 mission, the Orbcomm flight does not have the requirements that sending a Dragon spacecraft – stocked with cargo and experiments – to the International Space Station does. “The Orbcomm-2 mission does not require a relight of the second stage engine following orbital insertion. Flying the Orbcomm-2 mission first will, therefore, allow SpaceX to conduct an on-orbit test of the second stage relight system after the Orbcomm-2 satellites have been safely deployed. This on-orbit test, combined with the current qualification program to be completed prior to launch, will further validate the second stage relight system and allow for optimization of the upcoming SES-9 mission and following missions to geosynchronous transfer orbit,” SpaceX noted. For their part, Orbcomm expressed optimism that the firm’s payload would ride the “upgraded” version of the Falcon 9. According to the SpaceFlight Now report, Orbcomm will use the rocket originally planned for the SES-9 mission – with the Falcon 9 originally planned for the SES 9 launch being redirected to launch the Orbcomm satellites. “This change does not affect the timeline for SpaceX’s return-to-flight mission which is still targeted to take place in the next 6–8 weeks. The SES-9 launch is currently targeted for late December 2015,” SpaceX stated. The June 28 accident was determined to have been caused by a strut in the rocket’s second stage. This allowed a helium tank to come loose, which eventually resulted in the loss of the vehicle. SpaceX has been working to have the first stage of their Falcon 9 family of boosters to be reusable. Two prior attempts to have the first stage conduct a landing on a automated platform positioned out in the Atlantic Ocean – were close to achieving this goal – but were ultimately unsuccessful. 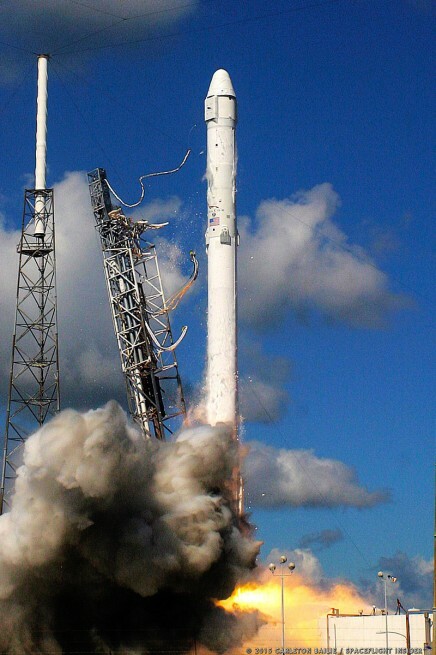 SpaceX has stated that it knows how to correct the issues revolving around the “excess lateral velocity” that were encountered during the April 2015 CRS-6 mission recovery attempt. In fact, SpaceX has been working on introducing the newly upgraded Falcon 9 to service so that it can utilize its new, stretched fuel tanks, thickened kerosene fuel, and other modifications to accomplish what no other rocket returning from sending a payload to orbit has done before – conduct a controlled landing. If successful, SpaceX CEO and founder Elon Musk, as well as many industry analysts, have stated this will be a game-changing event in terms of access to orbit as it should significantly reduce the cost of sending payloads to orbit.